Street Parked: No idea what this is! The nice thing about my weekend morning runs, is that I usually find something exciting parked on the street. This morning, I saw a Lamborghini LP-640 and a 997 Porsche Turbo. However what really caught my attention, is something that I know nothing about! I have absolutely no idea what kind of car this is! I love the stainless steel body, the open top and the Simpson harnesses, but I couldn’t tell you what it is for the life for me! Does anyone of our readers know? Bret, do you know? Whatever it is, it was definitely worth the walk to find. This entry was posted in Street Parked and tagged Awesome, classic, No idea what is this, stainless steel, Street Parked. Bookmark the permalink. Its a “new” Scarab, built in Kansas City MO. Found your site today from a tip at Speed Secrets Weekly, Ross Bentley’s weekly driving tip newsletter. As soon as I saw the photo I knew what it was! Scarab’s were built by Lance Reventlow, heir to the Woolworth fortune who later went on to build an Offy powered front engine F1 car just in time for the rear engine craze to take over…..
Hey! Thanks for letting us know! We’ve been trying to figure out what is was forever! Have to say I am stumped too. Devin was my first thought but Devins were not aluminum and the body while similar doesn’t match. It’s not an Elva either, at least not a Courier. It’s certainly reminiscent of many 50’s sport racers from Maseratis to Lotuses but it’s none of those. Perhaps it’s a custom special but if do then it is incredibly well done. Think you might be right. Who knows on the dash, though. As it looks like a kit car. Devins were fibreglass and this car is alloy , so it could be more likely an Elva as they were aluminium like Lotus . I think that it is an Elva , made in England in the 50’s and 60’s . 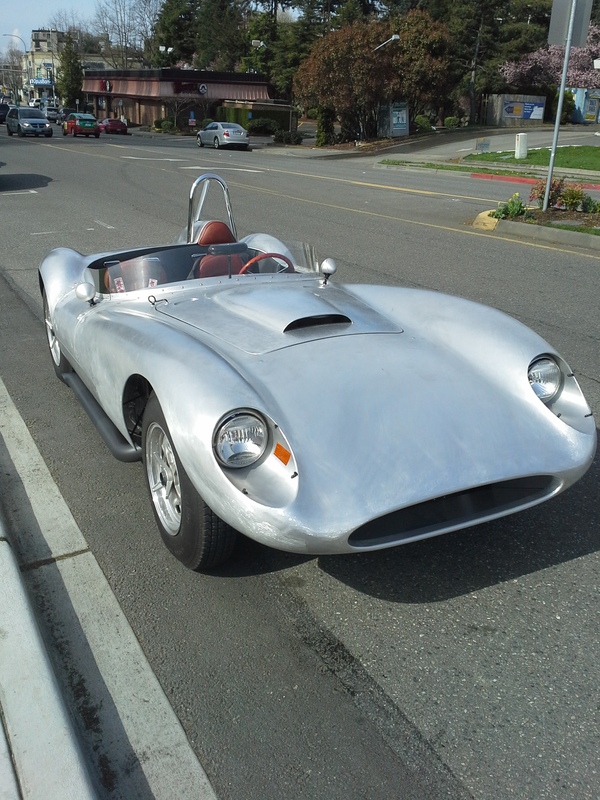 The owner had a Lotus 6 and decided to make his own similar lightweight cars . Elle va in French means she goes . I think that’s a Devin, Davin. This guy named Bill Devin from the South somewhere made kit cars in the 50s and 60s that looked like this. I’ve done some Googling and can’t find a Devin with that dash layout. The nose and tail scream Devin.